I received an advanced review copy of this book from the publisher. This book was originally written and published in Finnish and has been translated for this publication into English. The setting of this story involves the sad history of Estonia, a country that is caught between two fascist superpowers and never allowed to be free. The narrative moves back and forth between the period of World War II when Estonia is occupied by German forces, and the 1960’s when Estonia is under Soviet Control. There is a patriotic group of Estonians who are trying to cast off the oppressive yoke of the Bolsheviks that has a grip on the county in the early 1940’s. This group of revolutionaries are represented by the character of Roland. Roland is a farm boy who has led a simple life, but he trains in Finland with a group of rebel Estonians who want to oust the Red Army and declare Estonian independence. When the Germans cast the Red Army out of the country, Roland recognizes that one oppressive tyrant has been tragically replaced by another. He continues his underground resistance and his goal is to cast off the Germans who are just as cruel and harsh as the Red Army. Roland is a figure who possesses loyalty, honor and patriotism; he is true to his cause, the freedom of Estonia, no matter what happens in the story. Edgar, Roland’s cousin, serves as a sharp contrast to the loyalty of his closest family member. Edgar’s two driving goals in life are self-preservation and self-advancement. When the Germans take over, he assumes a new name and attempts to make a career among the German government in Estonia by managing some of their labor camps. When the Germans are run out of Estonia, Edgar takes on yet another new name and tries to ingratiate himself with the Soviet government by writing a book about all of the German atrocities that were committed while Hitler’s armies occupied Estonia. Edgar does not particularly care who is in charge of the government, as long as he is seen as someone who is worthy of praise and attention. His greatest desire in life is to be given special privileges and recognition as a result of his work for the government. The most tragic character in the book is Juudit, Edgar’s wife. Juddit is truly in love with Edgar when they first marry and she has such high hopes about spending a wonderful life together in wedded bliss. However, Juddit is sorely disappointed when Edgar refuses to have any sexual relations with his wife. It becomes apparent in the book that Edgar is homosexual and has no intentions of carrying on a physical relationship with a woman. When Juddit meets a German officer stationed in Estonia, she has a mad, passionate love affair with him that lasts for the duration of the German occupation. Juddit finally feels loved, wanted and fulfilled when a German officer gives her all of the attention and affection that she so desperately desired from Edgar. Unfortunately for Juddit, when the Germans are driven out of Estonia, she is forced to go back and live with Edgar, at which point she carries on a sad and wretched life fueled by lots of alcohol and pills. Sometimes the dual narrative that jumps between the two time periods becomes very confusing and convoluted. It is hard to keep the names straight of which person is on which side, who is working for the Germans and who is still loyal to the Russians. There are also certain storylines that I would like to have seen further developed. For example, the details of Edgar and Juudit’s reunion after the Germans withdrawal from Estonia is never described. How could these two people who despise each other end up living under the same roof again? Also, Roland’s fiancée, Rosalie, suddenly dies in the beginning of the book and the suspicious circumstances of her death are not mentioned again until the very end. Rosalie’s story could have been just as interesting as Juudit’s and I would like to have seen her character elaborated upon. Overall, this is an intriguing historical fiction novel about World War II that revolves around a scarely spoken of country that was the victim of two oppressive regimes. 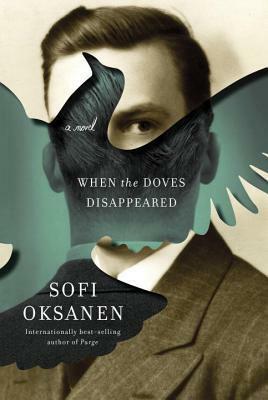 If you are a connoisseur of World War II historical fiction, then WHEN THE DOVES DISAPPEARED should definitely be on your “to read” list. 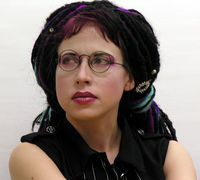 Sofi Oksanen was born in Finland to a Finnish father and an Estonian mother. In 2010 she won the Nordic Council’s Literature Prize for her third novel (originally a play), Puhdistus (Purge). Great review! It sounded so interesting that I got a copy and I’ve already started reading! Estonia has a gripping and difficult history, as the novel captures with these emblematic characters. In many ways, Estonia is similar to Finland and it sometimes shows up in “Scandinavian” guidebooks, but the painful ties to the old Soviet bloc persist. I am so excited that you are reading it, Lucy! I really didn’t know anything about the history of Estonia before I read this book. It is interesting and tragic.